Martin Nesbitt, Co-CEO of Vistria and chair of the Obama Foundation, speaks at the 2019 Leading for Good conference. Executives from the private, public, and social sectors came together at the sold-out Leading for Good 2019 conference in March. 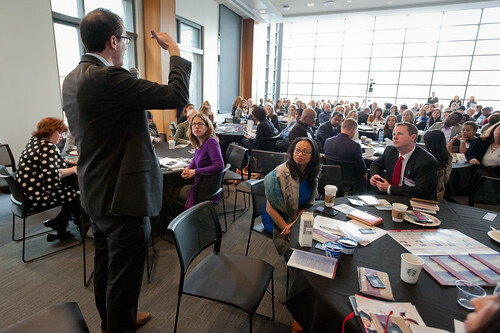 The daylong gathering provided attendees with the skills, knowledge, and network needed to accelerate social value creation in their companies and organizations. The conference opened with the tale of two cities present in Chicago, followed by a charge to executives to harness the positive power of business to build vibrant and inclusive growth for all. No sector can solve the issues facing society on its own. Companies and organizations need to actively seek synergistic partnerships across sectors. Ellen Alberding, president of The Joyce Foundation, emphasized how critical partnerships are with the private sector, especially when it comes to furthering racial equity and economic mobility. She also the emphasized the need to engage government around the idea of collective impact. “We have a really hard time being visionary and we’re very impatient,” said Andrea Zopp, CEO of World Business Chicago. “One of the challenges with real change like neighborhood change is that it takes a hot minute.” Leaders need to help people see the vision and give it time to happen. There is a lot of work left to be done, Zopp noted, and it is important to remember that we did not get to where we are now overnight. Many speakers emphasized that Chicago is fortunate to have a business and civic community that works together to drive social impact. Martin Nesbitt, Co-CEO of Vistria and chair of the Obama Foundation, talked about the pivotal role the foundation will play in putting Chicago even further at the forefront of social innovation. Experience the day and discover some of the key takeaways through the eyes of Loyola Junior Erin Lippert and other conference participants.